Food sure has a way of bringing people together. There’s just something about the process of creating dishes from scratch that interests me. There are countless pictures and recipes to follow through in order to piece a meal together, but the results will always differ from one person to another. I enjoy how cooking amongst friends brings the group of individuals closer together than ever before. Perhaps it is in the way we would often offer casual banter as we toss in a pinch of salt, or maybe it is in the jokes made as we stir in the chicken stock. Either way, the bottom line is that cooking together is an activity that highly involves communication and participation among all parties. The effort being put in is ultimately what makes the dish all the more special. It creates a meal that is not only satisfying, but one that will also be etched in the memories of those who chose to put the apron on together. The team at Vulcan Post are a bunch of foodies and we thought what better way to draw in the year to a close, than with a home cooked meal?I’m privileged to be able to enjoy home cooked meals often, and Sarah occasionally puts in some effort to cook her own meals, but our colleague Ajay has not yet cooked a single meal for himself in 2015. Hence, that alone was reason enough for us to have a Thanksgiving/Christmas dinner, and the prerequisite was that the meals had to be cooked from scratch. There were several startups that we could look to in order to plan out our dinner and their business model is similar to one another. 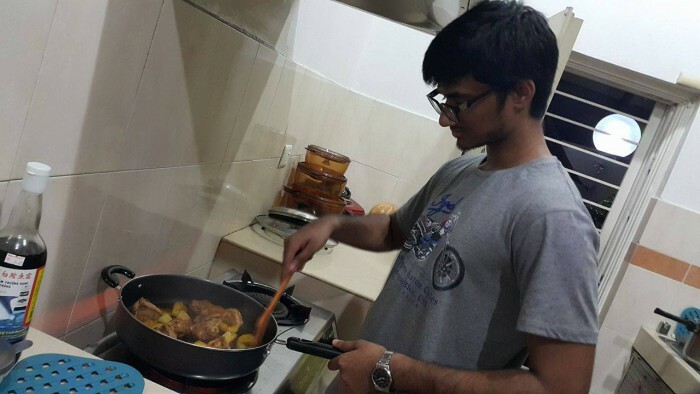 Such startups or businesses revolves around preparing ingredients for home cooked meals and portioning them accordingly to help customers to cook their meals as fast as possible with the least amount of hassle. Essentially, there is no need for grocery shopping, or cutting and cleaning the ingredients, customers just have to cook and clean the dishes after—one such startup is Fooddit. 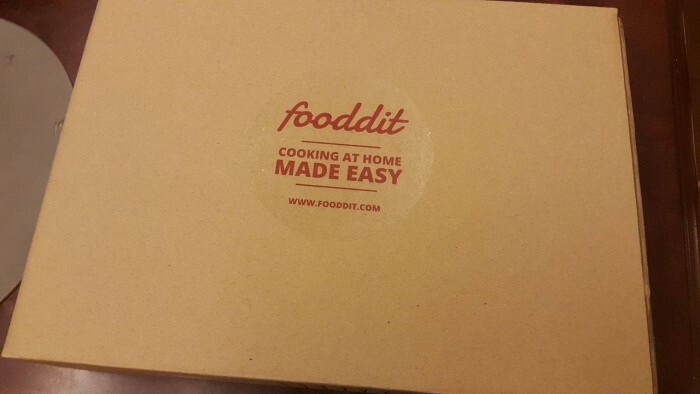 Fooddit may be new to the startup biz, having only begun on September 14 this year, but they promised us a 30-minute meal with squid ink pasta and chicken pongteh in the package, and we begun to salivate already. 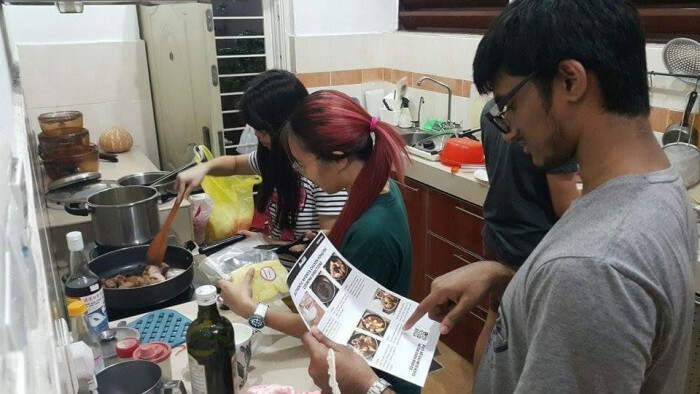 Fresh ingredients are their forte and for 2 meals of 2 portion sizes each, it would only cost RM60 inclusive of free shipping in the Klang Valley. Though there were some hiccups in the delivery process where we received our package slightly later than expected, we were still eager to give the meals a go, mostly because dinner time was fast approaching and we were excited to see what this startup would literally bring to the table. 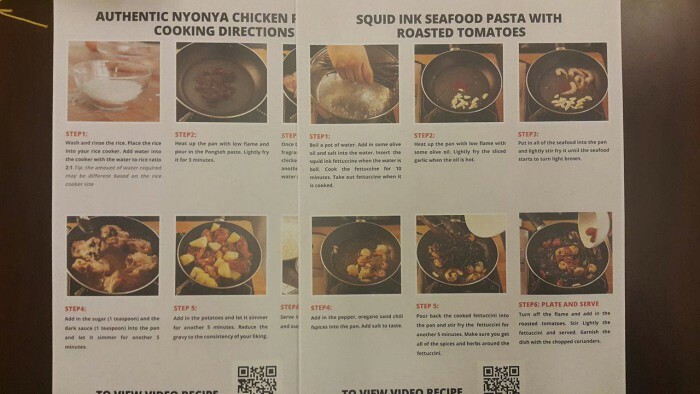 The meals that we were able to try out in order to sharpen our culinary skills, were “Authentic Nyonya Chicken Pongteh Served With Sambal Belacan” and “Squid Ink Seafood Pasta With Roasted Tomatoes.” It already sounded great, so we knew we had to start as soon as we laid our hands on the brown packaging. The clock struck 8pm and we began our preparation. The first step had been to divide the ingredients into two separate categories so as to expedite the cooking process. All of Fooddit’s ingredients were portioned out nicely, and one thing that struck me was how Fooddit differentiates themselves from their competitors. “Hey, I could definitely reuse this!” Sarah said, as she opened the Fooddit containers. This was because, the startup had used durable plastic containers to store some of their condiments, instead of plain ol’ plastic bags. Within the package from Fooddit, there were colourful recipe cards provided as well, each of which provided us with extensive instructions down to the exact minute on how long each ingredient should spend tossing around in the hot pan. 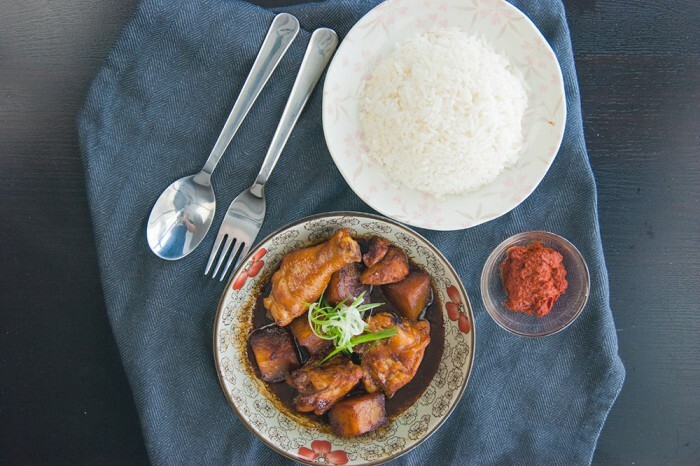 Finally, it was time to get cracking, and the first dish we decided to try was the chicken pongteh. I was initially doubtful that this dish could be prepared in under 30 minutes, for I had always imagined in my head that proteins would take an awfully long time to be fully cooked. I decided to give it a go anyway, and buttered the pan with some sauce, prior to dipping in the chicken slices. Seeing since each of us in the team did not have a particular affinity towards sambal belacan, we decided to omit it. The black sauce was duly added in instead, to give it an aromatic and savoury flavour. As I stirred the chicken back to front several times, Sarah decided that it was Ajay’s turn to put in some elbow grease, so to speak. I watched him toss and turn the chicken cubes which were sliced in good-sized portions. Knowing that proteins takes longer to cook, the Fooddit team were mindful enough to slice them in such sizes, and we were thankful because tummies were already rumbling away. Next, according to the recipe card, would be the potatoes, which Ajay dipped in and continued to stir for several long minutes. Who knew potatoes would take up to 20 minutes to be fully cooked, for I certainly hadn’t! 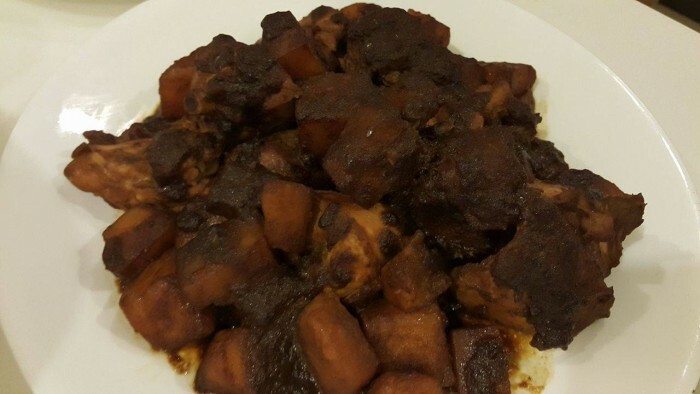 Our version of the ‘chicken pongteh’ dish. Sarah, who has more experience in cooking, pointed this out, and suggested that the potatoes be sliced into smaller cubes so as to hasten the cooking process, which we did. In total, the entire dish took 23 minutes to cook, proving me wrong all along. 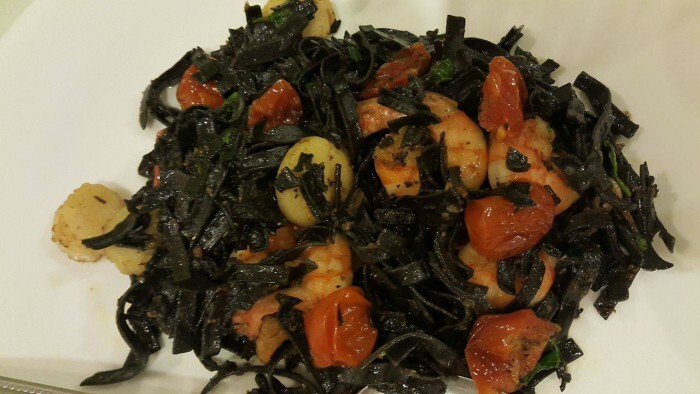 Next, I reached out for the packets for the next dish, which was the squid ink seafood pasta. To my dismay, the spaghetti strips had somehow broken into tiny pieces during the delivery process. “Consider the team at Fooddit kind enough to chop the dish into bite-sized portions for you,” Sarah offered kindly to Ajay when she saw the look of dismay etched across his face. I guess there’s always a silver lining to everything, for the dish did take slightly less time to cook due to it being smaller in size. It was only an average of 6-7 minutes before the pasta was ready, and so was Sarah, as she heated up the pan for the next step on the recipe card, which Ajay read aloud. With a dash of oil and some onion, the drained pasta was quickly added into the hot pan, and Sarah took extra care to toss them around before adding the roasted tomatoes, prawns and coriander leaves. The Fooddit team took the time to pick out fresh prawns and that made all the difference during tasting time, which we realised was sooner than we had thought. 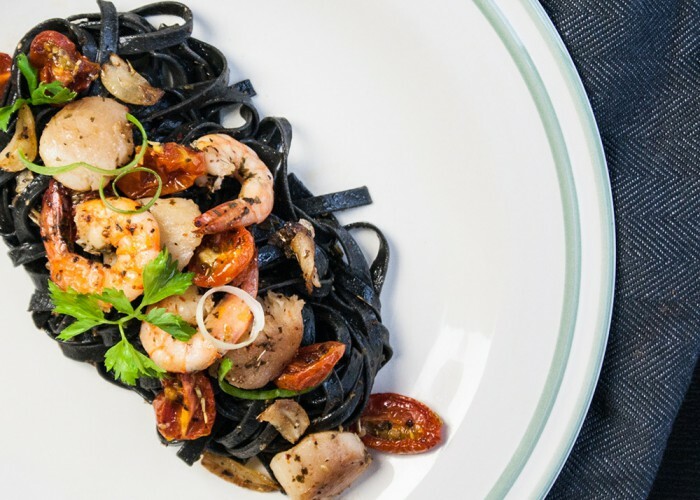 Our version of the squid ink pasta. Finally, the dishes were ready to be served and as we watched the plates brimming with food, we knew that it was time for the verdict. “The potatoes could be cooked a little longer,” Sarah noted as we tried the dishes. The chicken pongteh, however was fully cooked and the portion was enough for all 3 of us. It was not tough at all to feel thankful for our filled tummies as we dug into the sumptious pasta dish. Fooddit had not provided us salt for this dish, which would have been a downer, had we not had salt of our own. However, the fresh prawns and succulent tomatoes made up for it, making it quite a well-rounded dish indeed. As we cleaned off our plates, the dinner came full circle and our verdict was unanimous. Though the dishes were much simpler in nature when compared the review we did with Urban Stove (in general, the meals we had from Urban Stove were more atas in nature and has more of a gourmet vibe), they did deliver to our expectations of satisfying meals that can definitely be created under 30 minutes.